Think that it won’t happen to you? You never know as this might happen – losing our wallets. Be it in the crowded Mumbai local or the air-conditioned Delhi metro, we are always finicky about our prized possession as it would contain our credit and debit cards (multiples of them), PAN cards, license, apart from the hard cash of course! Now, there seems to be some respite against such fraud incidents and wallet thefts, thanks to a company called OneAssist. OneAssist Consumer Solutions, the Sequoia Capital and Lightspeed Venture Partners funded company, has announced launch of the new WalletAssist, a unique protection plan which provides cover against any kind of fraud on your credit and debit cards. It also includes cover against skimming, phishing, counterfeit cards and even PIN based frauds, which happen at the ATMs or POS machines – meaning a one-stop respite against all internet frauds around you. Phishing occurs when a fraudster sends a fake e-mail to a customer seeking his bank account, debit/credit card details, which he then uses for fraudulent transactions using the compromised identity & card information. Skimming on the other hand, occurs when a fraudster inserts a skimmer inside the POS machine or ATM slot, which copies data on the customers debit cards and then uses the stolen credentials for fraudulent transactions. 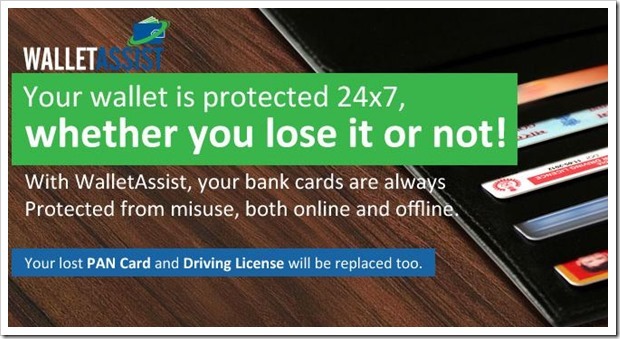 In the event of a lost wallet, instead of raising your blood pressure and bearing the tension calling multiple banks, all the customer has to do is make one call to OneAssist and they block all your cards within minutes, avoiding any possible frauds. With WalletAssist, customers are also protected against any fraud that could have happened on the cards from 7 days prior to reporting loss for an amount up to Rs. 2,50,000. You will also get his PAN card & driving license replaced for free, which is a doorstep service. Apart from this, if you are travelling in India or abroad, WalletAssist will also settle your Hotel Bills, book your return tickets and help you with lost passport assistance and foreign language interpreter! Wow, did you say? WalletAssist comes with 2 different plans viz. A Power Plan costing Rs.1299 annually with a fraud cover of Rs.1,50,000 and Privilege Plan costing Rs.1799 annually with a fraud cover of Rs. 2,50,000. To put in perspective – pay Rs 3.59 a day (cover of Rs 150,000) or Rs 4.93 a day (cover of Rs 250,000) for assistance and protection – a complete peace of mind. Worth every paise, you would say! Bouquet of services offered: One call to block all cards, one call to block sim of phone, lost card fraud cover, free replacement of PAN card and license, emergency hotel bill settlement/ticket assistance/cash assistance amongst others. So instead of checking your pockets every single minute for that wallet’s presence, don’t you think it is worthwhile investing in such plans and get a peace of mind? What do you think?